Nori Nakamura's mother, who lived near Hiroshima, had a rule for when her son went out to play. "My mother did not want me to wear colored shirts in the summer," said Nakamura, a radiation biologist, born the year after the atomic bomb fell. "Only white." The rule wasn't about fashion, he said. It came from a lesson well-learned. His mother had seen the permanent record carried by survivors of the atomic blast. When the bomb fell, it burned their morning's wardrobe into them. Heat reflected off white tank tops, sparing skin; dark shirts absorbed it, charring flesh in checkered patterns. A mile from its center, the Hiroshima bomb singed black ink out of untouched white paper. Every survivor of Hiroshima and Nagasaki has a similar story. But while their individual testimonies are moving, perhaps the most important tale told by these men and women -- more than 40 percent of the survivors remain alive -- has been collective. It is how they have lived, and how they die. For more than six decades, their medical histories have provided the authoritative source for how scientists understand the effects of radiation on the human body. 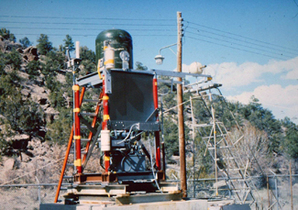 Frustrated by dose uncertainties, scientists at Los Alamos created a replica of Hiroshima's "Little Boy" bomb in the 1980s, pictured here in a rare trip outside its concrete containment. Photo courtesy of George Kerr. "These radiation standards are accepted worldwide," said George Kerr, a consultant and health physicist, formerly of the Department of Energy's Oak Ridge National Laboratory. "They're kind of the Rosetta Stone." The lessons from this cohort have never been more visible, as another radiation crisis has gripped Japan. With few exceptions, each invocation of the possible cancer risk -- or lack of risk -- poised by the failed reactors at the Fukushima Daiichi nuclear plant has its origins in the lives of atomic bomb survivors. A disaster caused by man has resulted in one of the longest and largest health studies ever conducted, led by Japan's Radiation Effects Research Foundation (RERF). Similar efforts could follow for Fukushima. The science, it seems, has come home to roost. Working from a hilly park overlooking a rebuilt Hiroshima -- he used to play nearby as a child -- Nakamura has returned home, serving as RERF's chief scientist. The foundation, unsung and sometimes controversial with its U.S.-funded origins, has studiously followed nearly 100,000 bomb survivors since the 1950s. It has charted every death, every cancer, its staff laboring in half-moon Quonset huts hastily erected after the war. The foundation's efforts have been a longtime collaboration between the United States, especially the Energy Department, and Japan. At times, it has required monumental effort. At one point, with little fanfare, U.S. scientists reconstructed the Hiroshima bomb, unique in its design, to get a better sense of the radiation it released. Geneticists probed survivors' children, searching for any evidence of lasting defects. And, most importantly, the survivors remained active, many checking in with RERF's doctors every two years. "This is one of the largest medical cohorts ever," said Kiyohiko Mabuchi, a senior scientist at the National Cancer Institute's epidemiology division, who led RERF's epidemiology unit for years before moving to the United States. "These people have been followed for [a long] time." 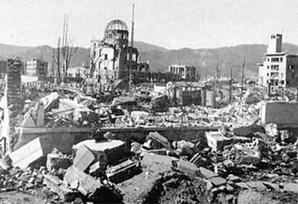 The bomb, detonated 600 meters above Hiroshima on Aug. 6, 1945, killed up to 120,000 of the city's 330,000 people. Many died from its concussive force and heat. But even before this shockwave, it unleashed an invisible plague. It look less than a millionth of a second for the bomb to shoot Hiroshima through with hyper-energetic radiation. These charged photons passed through wood beam and plaster wall, tearing into vulnerable human cells. Radiation sickness claimed many lives. The blast was horrific, yet many survived its radiation. RERF has followed some 54,000 people who received high doses of radiation from the bombs, along with another 40,000 people, located several miles from the bombs' hypocenters, who received low doses. (Another 26,000 provide a control group.) Thanks to Japan's koseki family registration system and cancer registries established in Hiroshima and Nagasaki hospitals by the late 1950s, nearly every member of RERF's life-span study, as it is known, has been successfully tracked for decades. Given RERF's fearful origins and the study's scale, its findings can seem confounding in their modesty, especially this central result: Out of the atomic survivors tracked by RERF -- nearly 100,000 people -- only 853 cases of cancerous tumors, so far, can be attributed to the bombs. With its youngest members about 66 years old -- A-bomb survivors exposed in the womb are part of a separate study -- the survivors have developed plenty of tumors, about 17,448 cases. But 5 percent of these are attributable to radiation, according to RERF. The number rises to 11 percent when limited to those receiving more than 5 millisieverts (mSv) of radiation, using a common standard. Typically, these survivors received significantly higher doses, with a mean average of 210 mSv; lower, notably, than the total dose allowed to Fukushima's radiation workers. One immediate, unwelcome reminder from the atomic survivors is that cancer is incredibly common. More than a third of the U.S. population will develop cancer during their lives. It is a disease of aging and genetic error, and modern medicine has extended human life considerably, upping the disease's odds. Separating the additional chance that radiation doses, especially low doses, add to this risk requires more people than even atomic devastation can muster, Mabuchi said. "The question of a minimum radiation that can induce cancer, that's a very difficult question to untangle with epidemiology," he said. "At the lower end, it's a problem of statistical power. You need a huge number of people to detect a very small risk." Soon after the Hiroshima and Nagasaki bombings, once the U.S. government overcame its denials that the bombs' radiation could cause lasting health problems, the National Academy of Sciences oversaw the creation of the Atomic Bomb Casualty Commission, RERF's direct predecessor. The commission's research was scattered, largely case studies focused on acute effects, especially on leukemia. For Japanese survivors, there seemed little benefit in participating. "It was an American institute," Nakamura said. "It wasn't popular for 10 years. It was Americans who dropped the bomb. It was Americans who won the war. And it was Americans who tested the health effects of [radiation on] the Japanese. 'Are we guinea pigs?' That was a major concern." The steel and concrete of Hiroshima's ruins, seen here shortly after the bomb, contained signatures used to recreate the bomb's radiation. The domed building, center, still stands today as the Hiroshima Peace Memorial. Photo courtesy of RERF. There were also deep fears at the time that radiation exposure could cause deformities and mutations in future children. Arranged marriages fell apart if parents discovered a woman was an atomic bomb survivor, so many would say they were out in the suburbs when the bomb fell. Blood studies would eventually show their proximity to the bomb, however. Only people from the cities understand what it was like in those days, Nakamura said. Despite his personal connection, however, Nakamura did not set out to work at RERF; chance landed him there. At first, he planned to stay a few years, worried he could not conduct radiation studies on fish. But then he saw how few people from Hiroshima and Nagasaki worked in the field. "I started to understand how we probably needed someone like me," he said. "I was born after these events. I know how people suffered. I saw people with scarring on their skin." Japan's 1950 census established the number of Hiroshima and Nagasaki survivors -- there was a questionnaire dedicated to the bombings -- and a reorganization of the casualty commission led to the life-span study. The Japanese government had become more of a partner with the United States, buying credibility with survivors. The commission began offering free medical appointments every two years. Since 1958, some 17,000 survivors have dutifully returned for these exams. The cancer data from these survivors now underpins every radiation protection system in the world. For example, the National Academy of Sciences periodically publishes a report on the biological effects of radiation. Before it could entertain completing its most recent study, earlier this decade, it needed RERF's updated evidence. U.N. standards follow a similar tack. There are some very clear signals from the A-bomb survivors. Starting at acute doses around 150 mSv, there is statistically significant evidence that radiation exposure causes a tiny uptick in the risk of contracting cancer. This risk becomes far more evident at higher doses: At 1,000 mSv, four times the limit for Fukushima's workers, it increases the risk of cancer by about 1.5 times. The linear increase seen in this cancer risk has encouraged regulators to set safety standards far below proven hazardous levels, essentially on the precautionary principle. This estimate, called the linear no-threshold hypothesis, remains controversial. Even supporters of the standard cringe when they see media and foes of nuclear power use extrapolations from the high doses at Hiroshima and Nagasaki to argue for low-dose cancer incidence. The policy often eclipses the science. This is an old, if obscure, argument in radiation science. More interesting to an active epidemiologist like Mabuchi, who also works on NCI's analysis of Chernobyl victims, has been the more recent findings developed from the A-bomb survivors. The study has verified a common theory that beyond dose, radiation effects are most strongly influenced by age. Adolescents are more at risk than adults. This makes sense, since radiation seems to trigger cancer by blasting apart DNA. The cell can repair such breaks, or go into planned recycling, but at times it may suffer a repair mistake -- a mutation -- that could lead to cancer. "Generally young people are more sensitive to radiation, and that makes sense biologically," Mabuchi said. "Their cells are diving more rapidly, so they might be more sensitive." The most important recent evidence, however, has been the persistence of an increased risk of solid cancer from radiation. People exposed 66 years ago are still developing tumors that can be tied to the bombs. Most of the A-bomb survivors under 20 in 1945 are still alive. As they grow older and pass away, much should become settled about persistence, Mabuchi said. "It may persist for a lifetime," he said. At times, he looks at the data and sees some indication of the risk going down. "But every time I look at it, it's different," he said. "This will be determined by the people still alive." There is one thread that runs through all of the work done at RERF, one variable on which all of its evidence, and the world's radiation standards, depends: dose estimates. Through decades of work and revision, Japanese and U.S. scientists have reconstructed the estimated dose of radiation received by nearly every bomb survivor, totaling more than 200,000 people. Shifts in these dose estimates move the very foundations of radiation science. These reconstructions are first based on the survivor's testimony, taken some years after the bombs fell. Where they were, what they were doing. At times, the stories were vague, and some doses were immediately deemed impossible to calculate, said Kerr, the former Oak Ridge physicist who has collaborated with RERF on dose estimates since 1973. "There were people in crowded street cars," he said. Groups are difficult. Humans can be excellent radiation shields. "We have no way of calculating dose for a person exposed in a street car. We're not sure how many people were standing between him and the bomb." Each type of construction material blocked the bombs' radiation differently. There were often layers upon layers of homes, especially in dense Hiroshima; the houses had to be evaluated in clusters. In Nagasaki, an industrial town, the bomb irradiated factory workers on the line. Even one strategic concrete pillar could swing the dose. Since the bomb exploded above the cities, surrounding hills blocked the radiation's linear path, survivors thankful for shade from the atomic age's dawn. Beyond buildings and earth, dose estimates have had to tangle with the trickiest material of all: ourselves. Based on survivors' testimonies, scientists created "phantoms," adaptations of the body that could be used to judge self-shielding, how body parts intercepted radiation bound for the thyroid, lungs and several other critical organs, Kerr said. When the bomb hit, some phantoms were standing. Some phantoms sat. Others, knelt. There were no radiation monitors in the cities, of course, so the number of gamma rays and neutrons released by the bombs had to be estimated. This was easy for the Nagasaki bomb. Nicknamed "Fat Man," the bomb's design, explosives encircling plutonium, became the U.S. standard, and numerous weapons tests, while leaving lasting traces in the atmosphere, provided a wealth of data. Nuclear scientists even built replicas of Japanese homes in the bombs' radius, one last house blown away. Hiroshima's bomb, "Little Boy," was the challenge. The bomb was unique, shooting two uranium cores together for its explosion. The Manhattan Project had never tested it, and the United States never built a similar bomb. This left doubts about the theoretical estimates made of Little Boy's radiation, especially the neutrons it released. There seemed to be disagreements between concrete activated by the bomb and calculated doses. It was called the "Hiroshima discrepancy." For RERF's study results to carry weight, these questions needed to be resolved. There was only one possible solution: They had to resurrect Little Boy. Subject to little outside notice, scientists at Los Alamos National Lab built a replica of Little Boy in 1982, sequestering it in one of the lab's heavy concrete buildings. The only changes made were a shortening of the gun barrel and dummy initiators. (An accidental explosion would have been embarrassing.) Scientists studied the device for several years, pouring over how many neutrons would escape or reflect back into the device during its critical reaction. "Nobody really appreciated how odd [Little Boy] was compared to other weapons," Kerr said. The replica validated this finding and how device design could influence dose rates. In the end, he added, "what we found was that the Hiroshima device was strange." Largely, DOE scientists found that Little Boy matched their calculations, leaving disagreement with evidence collected in 1945. Samples of steel, concrete and brick taken from the city's ruins had been permanently altered by the bomb: changes in chlorine isotopes found in concrete, or cobalt in steel. Japanese scientists soon realized that many of these samples had been interpreted wrong, confused by background radiation or, for concrete, atmospheric fallout. After all that work, Kerr said, "we found out the calculations were right." When it comes to fear about radiation's health effects, cancer is a late arrival. Several decades before World War II, scientists had become fixated on concerns that high doses of radiation would cause mutations and deformed offspring in humans. Experiments with fruit flies exposed to massive radiation doses showed such shifts, though the flies could survive far more radiation than a human ever could, absorbing up to 30 sieverts. When the bombs fell, then, immediate concerns focused on the survivor's children. Even before RERF's life-span study, two ambitious American scientists found and monitored 77,000 recently born children in Hiroshima and Nagasaki. (Future work added 10,000 children in the womb during the bombings.) Defying all expectations at the time -- the same type of fears that gave rise to 1950s horror movies -- there was no evidence of increased stillbirths, malformations or deaths. In fact, despite much work, scientists have never discovered any genetic effects in these children. Before taking over as RERF's scientific head, Nori Nakamura led the lab's genetic work, which has continued to produce a strong lack of evidence for decades. There are theoretical reasons, based on mice, why mammal sperm and eggs don't seem to propagate radiation-induced mutations. (During the 1950s and 1960s, Oak Ridge dedicated millions of mice to studying this question.) But perhaps the most important revelation in genetics has come only recently, Nakamura said. "Suddenly, we've realized that our genome is not at all perfect," he said. As data have begun pouring out of whole-genome sequencing efforts, geneticists are seeing that most humans already carry a plethora of mutations and broken genes. A paper several years ago showcasing the genome of James Watson, one of the discoverers of DNA's structure, indicated that he had what appeared to be 50 broken genes. This has deeply influenced Nakamura's thinking, he said. "If I express my mind like a cartoon ... of the genetic effects of radiation, I pictured a clean white board, shot with a shotgun, with a lot of holes," he said. "But the story has changed. Our white board already has many holes." At least from mice experiments, it appears that 1,000 mSv of exposure will add 0.2 mutations to a genome. On a plain white board, that seems daunting. But in reality, when we all carry 50 or more mutations, the number is no longer so dangerous, he said. RERF will keep using ever more sophisticated tools to try and detect genetic changes, but as chief scientist, Nakamura's curiosity has settled on revisiting survivors' dose rates. The interviews reconstructing the survivors' locations were not conducted for nearly a decade and by then many had suffered from discrimination, losing out on jobs and marriages. "There's no guarantee that those people responded honestly," he said. Blood tests have helped to correct these claims, but Nakamura would like to add more precision to these measurements. Gamma rays, it turns out, cause charged carbon to create lasting traces, kind of like holes, in the crystalline structure of tooth enamel. Using electron spin resonance, these traces can be detected, and now work needs to be done testing whether doses can be extrapolated from these teeth. If Nakamura is successful, any shift in doses would echo around the world. "One [sievert] could be 0.8, or it could be 1.5," he said. "It could change the dose response." Once Nakamura finishes his tooth work, if he does, he will likely leave RERF, glad that a son of Hiroshima had contributed to the city's legacy. At the very least, the atomic survivors will live for 30 or 40 more years. Their children are now subjects. Fukushima residents may be next. The study has already outlasted many of its scientists. There is another story about that day in August that Nakamura's mother used to tell him. They lived in a village about 20 kilometers from Hiroshima's center. Every morning, she commuted downtown. On the day of the bomb, she was running late and missed her usual train. "That's why I'm here," Nakamura said. There was no second train.